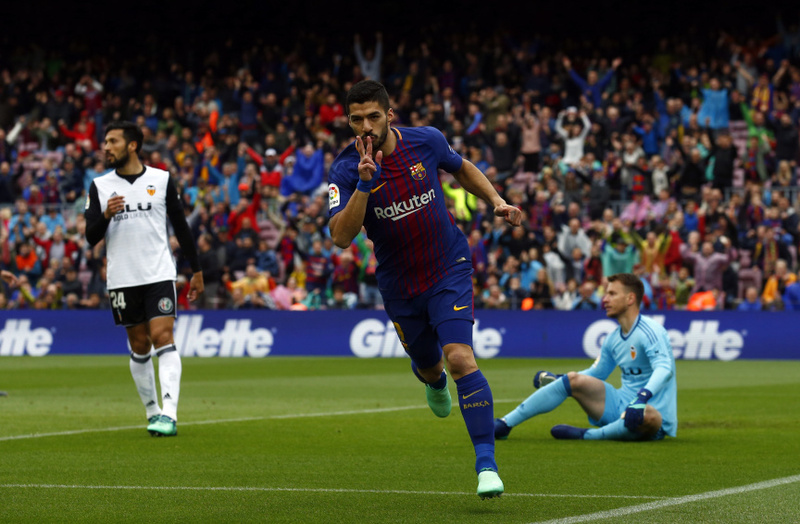 BARCELONA, Spain (AP) — Barcelona set a Spanish league record of 39 consecutive games unbeaten on Saturday, as it rebounded from its humbling Champions League exit by defeating Valencia 2-1 to continue its march to the domestic title. Philippe Coutinho set up goals for Luis Suarez and Samuel Umtiti to help Barcelona establish the new Liga milestone. The feat came four days after the Catalan club squandered a 4-1 first-leg advantage by losing at Roma 3-0 and failed to reach Europe's final four for the third year in a row. With its hopes of a rare treble ended in Italy, Ernesto Valverde's side stayed well on course for a double in Spain after dealing third-place Valencia its first loss in 10 rounds. "These three points are gold," Valverde said. "Sometimes this club's fans tend to get downcast easily and when there is a loss like Tuesday's everything falls apart. We needed to step it up today. And I must congratulate my players because it wasn't easy." Barcelona, which plays Sevilla in the Copa del Rey final next weekend, opened up a 14-point gap over second-place Atletico Madrid before the latter's game against Levante on Sunday. After that there will be six rounds remaining. Barcelona took the record outright by surpassing Real Sociedad's mark of 38 straight league games without a loss that had stood since 1980. Barcelona remains undefeated through 32 rounds this season. It also finished the last campaign without a loss over the final seven games under former coach Luis Enrique. "We wanted to reaffirm the great league campaign we are having after the setback the other day," Suarez said. "Records exist so you can break them, but the most important thing was to win considering the mood surrounding the team, which we know wasn't good. Our fans were angry." While Valencia kept Lionel Messi in check, Coutinho unlocked the visiting defense by threading a pass to meet Suarez's run in the 15th minute. The striker used one touch of his right boot to slot a low shot past goalkeeper Neto for his 23rd goal in the competition this season. The speed of Valencia's Goncalo Guedes caused Barcelona trouble throughout the first half. The Portuguese winger threatened with three strikes before striker Rodrigo Moreno forced Marc-Andre ter Stegen to parry his shot off the bar after Valencia's pressure caused an errant pass by Barcelona's goalkeeper. Gerard Pique hustled back to clear a goal-bound shot by Moreno early in the second half after Umtiti slipped and gifted Valencia a perfect opportunity to equalize. But the France center back gave Barcelona the cushion it needed in the 51st when Umtiti headed Coutinho's corner kick onto the turf and in off the hands of Neto. Valencia's Dani Parejo scored from the penalty spot in the 87th after Barcelona substitute Ousmane Dembele rashly fouled Jose Gaya in the box four minutes after going on. Ter Stegen almost stopped the spot kick, which squirmed under him and over the line. "We played a good match today, too bad we were missing our finishing touch," Valencia coach Marcelino Garcia Toral said. Midfielder Steven N'Zonzi scored from long range to complete Sevilla's comeback from two goals down and draw with Villarreal 2-2 in a match where both sides ended with 10 men. Manuel "Nolito" Agudo made up for a missed penalty by pulling one back for Sevilla in the 78th. N'Zonzi struck four minutes later. Daniel Rabaseda opened the scoring for Villarreal and then set up Carlos Bacca to make it 2-0 after Sevilla's Wissam Ben Yedder was sent off with back-to-back bookings in the 61st. Nolito's poor spot kick came after a handball by Jaume Costa, which earned him a sending-off with a second yellow card. The stalemate left Villarreal in sixth place and Sevilla in seventh. Adrian Lopez scored twice as Deportivo La Coruna won at Athletic Bilbao 3-2 and moved to within five points of safety. Markel Susaeta scored Bilbao's second goal directly from a corner kick, with the curling ball hitting the turf before finding the opposite side of the net. Mikel Oyarzabal scored his third goal in two matches to give Real Sociedad a 1-0 win at relegation-threatened Las Palmas, while Miguel Guerrero gave Leganes a 1-0 win over Celta Vigo.